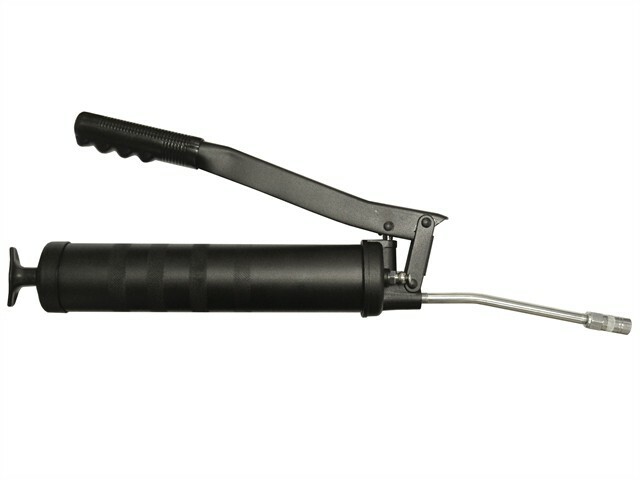 The Faithfull heavy-duty side lever grease gun develops up to 10,000 psi - 690 bar of pressure. The gun features an aluminium diecast head with an easy locking plunger system and ergonomic pump handle grip. The positive grip plunger handle, and the bulk loader system with an air release valve, combine to make this grease gun very efficient and easy to use. A variable lever stroke feature is built-in for use in confined areas and the four jaw hydraulic coupler ensures that the grease goes exactly where it is needed at the press of the lever. With a 500g (16oz) capacity, the gun can be bulk filled by its suction action but will also accept 400g grease cartridges.